Comfey in game: 473 Who? Important notice! Pokemon Comfey is a fictional character of humans. Comfey (Japanese: ??? ?— Cuwawa) is a Fairy-type Pokémon introduced in Generation VII. 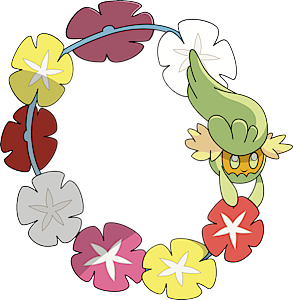 Comfey is a small, light green Pokémon with several flowers surrounding it. Its main body has an orange face with oval, light green eyes. On top of its head is a long, fluffy green crest that curls slightly over its face and extends backwards. A thin blue thread is attached to the back of its head, and has several flowers attached to it. The flowers are white, purple, red, and yellow. Comfey usually holds the last flower in its two short arms. On either side of the main crest is a smaller, pale yellow tuft. This Pokémon picks flowers to create the ring around itself, and will give these rings to those it likes. The flowers can also be thrown at enemy Pokémon to create an opening to either flee or attack. Comfey spreads oil from its body along its flower ring. The oil changes the flower so they emit a soothing fragrance that affects both Comfey and its allies. This aroma can also help with the treatment of people and Pokémon at hospitals. Nurse Joy in the Alola region are assisted by Comfey. 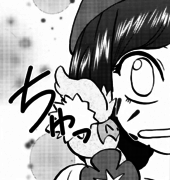 Nurse Joy's Comfey first appeared in SM004. Comfey first appeared in the Sun & Moon chapter, where one was placed around Moon's neck by a Dancer. 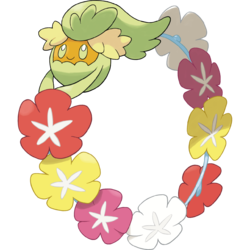 She is immediately startled by it as Sun laughs from her reaction, commenting that he also thought that it was a lei when he first came to Alola. SM Pokémon Center Birthday Comfey All Japan 10 November 18, 2016 to ??? Moves marked with a superscript game abbreviation can only be bred onto Comfey in that game. Comfey is the only Pokémon in the Grass Egg Group that is not a Grass-type. Comfey is tied with Joltik, Flabébé, Cutiefly and Cosmoem as the smallest Pokémon. Comfey appears to be a living lei. The way it holds its vine-like tail may also be inspired by the Ouroboros. Comfey may be a combination of comfy, comfort, comfrey, fey, and lei. Cuwawa may be a combination of cure, ? wa (ring), and ?? ?— furawa (flower).